Guerlain shower gel Les Délices de Bain, with its delicious musky citrus scent, transforms into luscious foam on contact with water. With its pure and refined lines, the bottle, created specially for this product line pays tribute to the famous Bee bottle. Les Délices de Bain line celebrates the art of a complete fragrance experience. 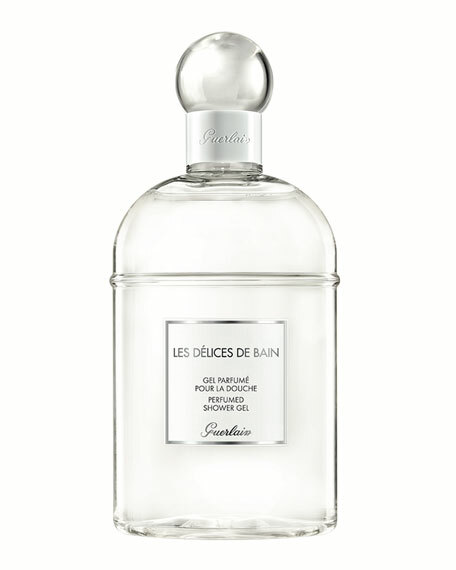 Guerlain has created a body ritual for men and women alike. A refined, delicately scented bath gel that represents the unmistakable style and timeless elegance of Acqua di Parma. Gently cleanses and purifies skin. Soothes and moisturizes with aloe vera and coconut oil. The spicy citrus scent blends hints of jasmine, amber, white musk, and refined florals. 6.7-ounce tube. Library of Flowers Linden Shower Gel, 16 oz.